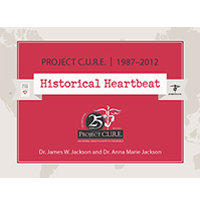 Historical Heartbeat is a glimpse into the 25-year history of the incredible journey that started as a family project and has grown into the worldwide humanitarian organization, Project C.U.R.E. You too can discover the secrets that have been employed by Project C.U.R.E. as "Best for Building a Business of Goodness" and enjoy the story and field photos of each milestone that was a significant point or occasion in Project C.U.R.E. 's development. The landmark of twenty-five years does not signal the end of an era, but gives confidence and courage to move forward with a grander vision of taking "health and hope" to the neediest people of the world.